We will be holding a Postgraduate Open Day at the Department of Typography & Graphic Communication on Thursday 20 March 2014. The day is primarily aimed at students who are interested in pursuing a Masters degree with us. Please email Zoe Ryan if you are interested in attending, or if you have any questions. We are delighted to draw attention to some items from the Banks & Miles Collection. This lovely set of 17 tins and drums were kindly donated by the once chief architect to the Zoological Society of London. Colin Banks and John Miles were the society’s typographical and graphic design consultants. The donor was also a close friend of the duo at the time. 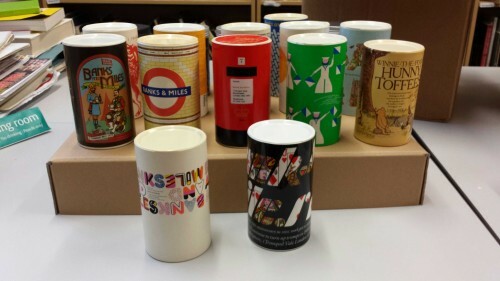 These tins and drums were sent out by Banks and Miles each Christmas to clients and associates, each relating to design work they had done that year. The examples in the collection range from the late 1960s- mid 1980s. Some of the tubs even contain their original contents. Our examples include a London Underground design, dating to 1979, when Banks and Miles revised Edward Johnston’s classic sans for London Transport. This drum contains two napkins with a red underground logo reading ‘Banks and Miles’. Another using the distinctive British Telecom design, this contains a very helpful international dialing code card. In 1975, they referenced their iconic work with the Post Office, turning the tub into a mini post box. These are such lovely objects, especially those containing their original gifts, showcasing some really great examples of classic British Design.